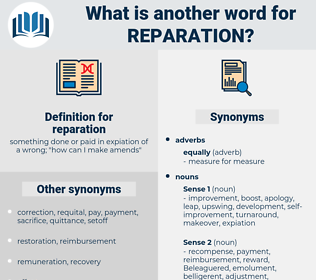 What is another word for reparation? something done or paid in expiation of a wrong; " how can I make amends"
Compensating, rectification, correction, satisfaction, repatriation, recovery, refurbishment, recourse, compensability, fixup. compensation, compensations, repair, repairs, redress, Repairing, restitution, indemnification. 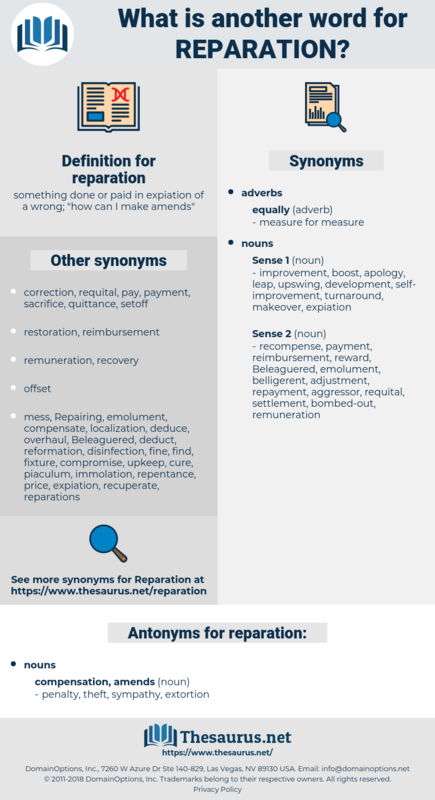 compensation, repair, redress, Repairing, recompense, restorative, reimbursement, restitution, indemnification. In their small way my animal books are the reparation I am now striving to make, and it has been my earnest desire to make them not only of romantic interest, but reliable in their fact. But to proceed, our companion will agree with me that repentance must be followed by restitution or reparation. River Tyne, Robert Owen, Robert Adam, reapportion.